A tale of two Bohemian brews. There aren't many markets in the U.S. that can boast breweries specializing in lagered beers, but Salt Lake City is lucky enough to have one of them. Since 2001, Midvale's Bohemian Brewery has been committed to bringing thirsty Utahns classic European-style lagers without fail. This month, the boys and girls at Boho have packaged two wonderfully different beers that require your attention. 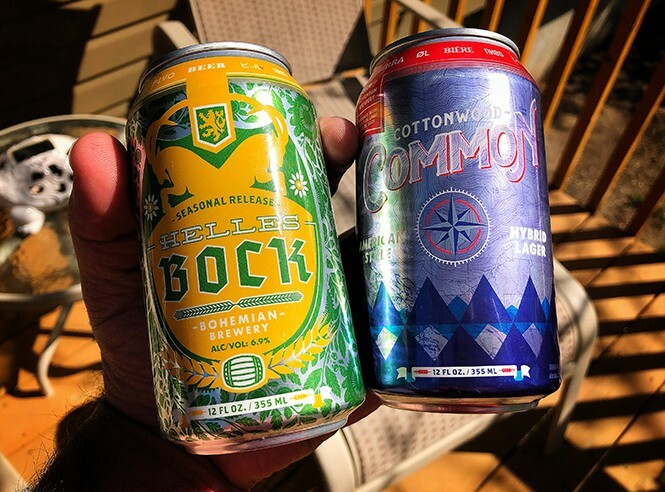 Cottonwood Common: This American beer style with German roots was born in the San Francisco area during the late 1800s. What makes it unusual is that it's made with cool-fermenting lager yeast, used at warm ale temperatures. This was mostly done out of necessity, due to lack of refrigeration. The result is a toasty and fruity beer that's highly drinkable. Bohemian's variation on the style is a clear orange/amber color, with a single finger of fairly dense and fluffy off-white head. There's a damned nice aroma with spiced greens, pine needles and a complex perfume of fruity yeast along with bready malt notes. The flavor follows with malty hints of toasted biscuit, dried fruit and light caramel, then fresh, herbal hops with pronounced bitterness. As the hops settle on the tongue, lingering notes of orange peel, pepper, pine and light toffee emerge. The end has a nice salad of herbal/floral/grassy earthiness that works well with the light 4 percent ABV, while the finish features a spicy/piney bite that doesn't linger too long. Overall: This is an excellent hoppy California Common style. The all-around complexity and balance of citrus/earthy hops, paired with fruity yeast and moderate bready malt flavors, creates a very smooth, crisp and easy-to-drink beer. Helles Bock: The Germans have many beers designed to fit the seasons, and late spring is Helles Bock time. This lager is generally much lighter in color than traditional bocks. The hop profile is also greatly increased, along with its higher alcohol content. Bohemian's interpretation has a sunny yellow color with a plentiful supply of pillowy white lather on top; this certainly looks like a sturdy lager. Just one whiff zaps me into my lederhosen, as the raw innocence of pale malts, the lightly toasted cereal and the vague, fruity yeast esters are all emblematic of the style. It's a wonderful aromatic trip. The taste is no slouch, either; wave after wave of honey-smacked golden malts wash over the tongue, combined with a bright citric bite that spreads bitterness and a light spiciness out across the palate. It has a nice toasted bready backbone, with just a light splash of butter thrown in, giving the malt profile a bit of a buttered biscuit feel at times. The finish is very dry, with lingering pith, but even the back end of this feels pretty tight. The carbonation is a bit tame, which makes this sit on the palate a bit too much. Overall: While nearly identical to many European Pilsner styles, this bock narrowly exceeds what one might expect from those. It features just enough malt and ester-like flavors to keep me coming back. The 6.9 percent ABV is hidden nicely, and rarely shows its face with strong alcohol flavor. Bohemian's brewers don't care about frills—they care about drinkability, and these beers definitely excel in that department. Whether you like your beers toasty and light or malty and slick, these two very different offerings deliver the goods on many fronts. Both are available right now at Bohemian Brewery. As always, prost!